What if sustainability didn’t mean giving up our cars? In light of this, we ask if it is possible to retain automobility and low-density living alongside safe, convenient, economical, and environmentally sound transportation. We have designed an ambitious vehicle, roadway, and land-use scheme to make transportation more sustainable while preserving the personal automobile use and suburban living that many people desire. Our plan constructs a dual roadway network with separate roads for low-speed, low-mass modes (LLMs) and for conventional, fast, heavy vehicles (FHVs). LLMs are distinguished from FHVs by mass and speed limits: LLMs have 1,000 lb maximum curb weight (the weight of the vehicle with fuel and fluids but not passengers or cargo) and 25 mph top speed. LLMs would include pedestrians, bicycles, pedicabs, mopeds, motor scooters, motorcycles, golf carts, and minicars. FHVs range from cars, trucks, and vans used for daily personal travel to tractor-trailers that deliver most of the goods we buy. Though conventional (i.e., not speed-regulated) motorcycles and scooters are below the mass threshold for LLMs, their capability to exceed the LLM speed limit means they would be classified as FHVs. 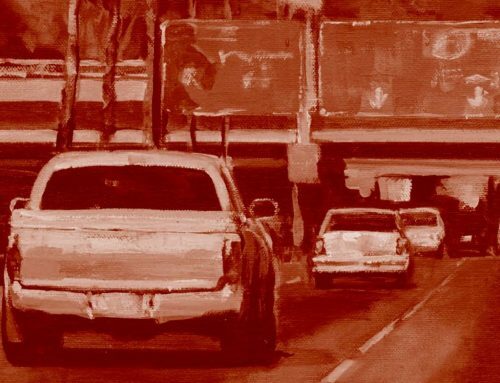 Differentiating vehicles by mass and speed is important, because many of the energy, environmental, safety, congestion, and land-use problems associated with motor vehicles and their infrastructure are related to kinetic energy (½mv2, where m is mass and v is velocity) of travel. In addition, vehicle mass and speed influence the kind of materials used to manufacture and design vehicles and infrastructure. Reducing vehicles’ kinetic energy will help mitigate all of these problems. For example, a speed limit of 25 mph will protect pedestrians and cyclists without sacrificing travel times for within-city trips, while the 1,000 lb weight limit still allows for practical and economically feasible small automobiles. Given these speed and mass limits, the kinetic energy of a heavy LLM traveling at its top speed is about one tenth that of a conventional passenger car traveling at 35 to 45 mph, which translates into important energy, environmental, and safety benefits. How, then, can we dramatically reduce the kinetic energy per passenger mile of travel? LLMs could use existing roads, but it is dangerous to mix light-weight, low-speed modes with fast, heavy vehicles. Given these safety concerns, we believe that LLMs and FHVs should not share any roadway space. Instead, the conflict between providing universal access to all travelers, and the dangers of mixing FHVs and LLMs, can be resolved by giving every household, business, and public place direct access to two separated, city-wide travel networks: one for FHVs and the other for LLMs. 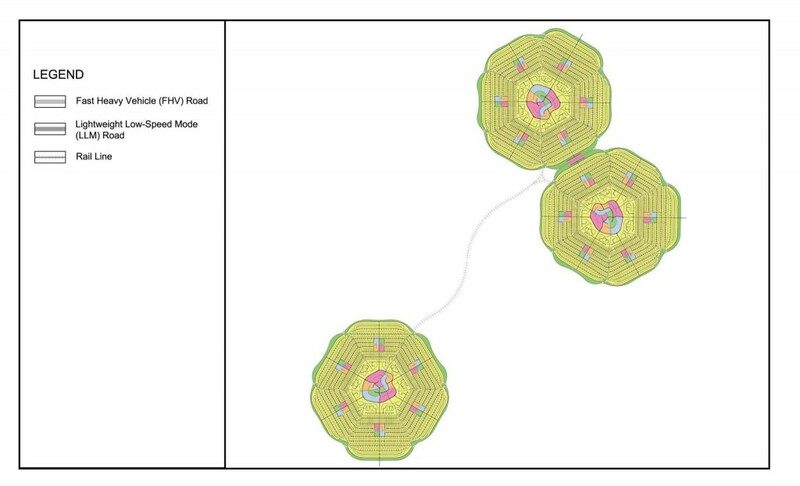 We propose a system of two citywide road networks with ring roads and interlacing radial streets (Figure 1). The two networks —LLM roads and FHV roads—serve every parcel of land but never intersect. A central LLM road encircles the town center containing shops, schools, offices, places of worship, civic buildings, inter-city transit stations, and so on (Figures 1 and 2). Radial LLM streets feed into the central ring road and provide direct, LLM-only access from all neighborhoods to the town center and other neighborhoods. Where traffic volumes are high, LLM streets can have separate lanes or paths for walking or cycling. The entire town lies within an outer high-speed FHV beltway. The FHV roads radiate inward from the beltway, interlacing with the LLM streets. FHV roads will both provide regional connections and provide FHV access to the town center via two or three radial roads. Beyond the central LLM-ring road, residential density decreases outward along each radial LLM/FHV road: high-density residential neighborhoods with multifamily dwellings are surrounded by lower-density single-family homes. 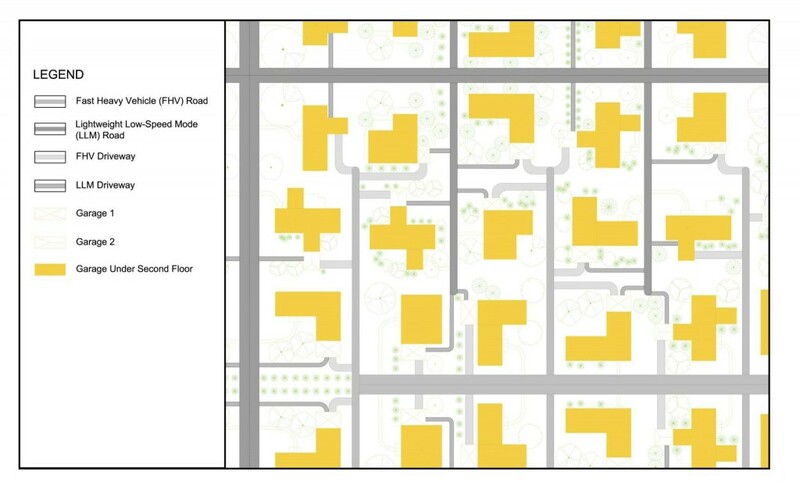 Each branch contains a neighborhood with parks, a school, public gardens, and shops (Figure 3). Private driveways connect the LLM and the FHV networks to private garages or parking areas. 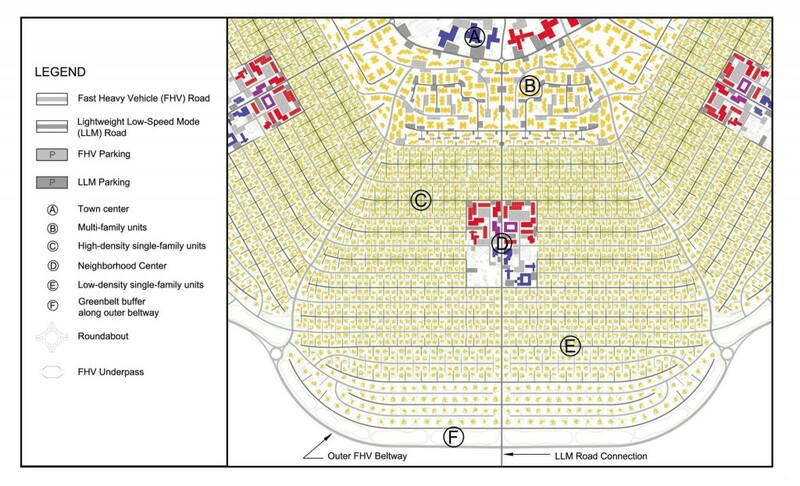 Possible driveway and garage/parking configurations include two garages per house, each connected to a road network; one garage that opens on two sides; or a driveway that splits in two and loops to both networks (Figure 4). Two or three houses may share driveways. 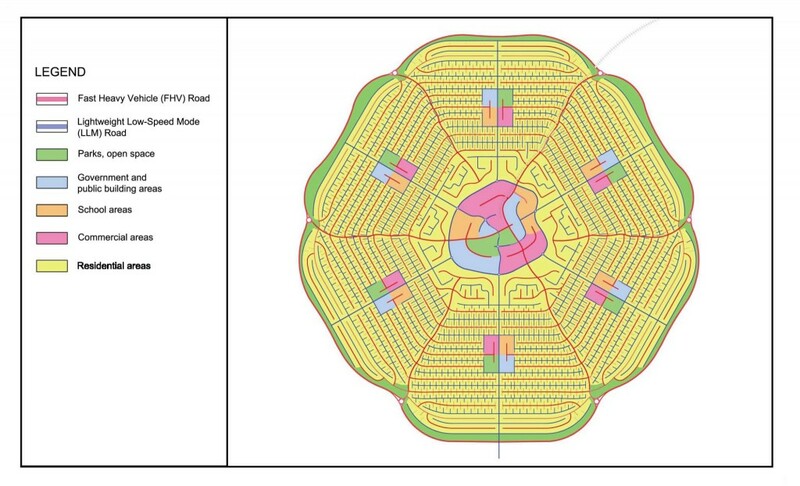 In connecting several such towns, the plan creates a poly-nucleated urban settlement pattern. Adjacent towns can share segments of the FHV outer beltway and be linked by intercity transit, rail lines, or LLM overpasses over the FHV ring road (Figure 5). Civic and commercial buildings, such as stores, offices, schools, and churches, are located in the town and neighborhood centers close to residences, rather than sprawled along commercial strips. LLMs provide convenient access to the town center from the high-density multi-family housing units around the town core. 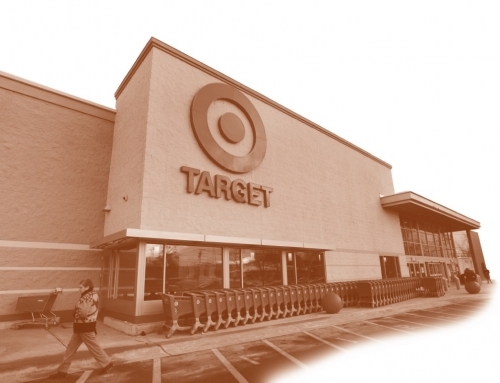 Big-box retailers such as Walmart and Target can locate along the outer FHV beltway, where they will be accessible to people in the community via FHV. Residential LLM branch roads function as neighborhood connectors to parks, elementary schools, shops, and services in neighborhood centers. There is no prescribed amount of urban high-density development relative to suburban low-density development; instead, the dual-transportation infrastructure integrates low-density suburbs with the rest of the community via LLM routes. The LLM network facilitates access, promotes social interaction, and integrates the town, creating the sort of “unified street space” advocated by some urban designers and town planners. The plan creates safe and pleasant routes for convenient access to the entire town via non-motorized transport. This facilitates a shift from the most socially destructive form of travel (FHVs) to the most beneficial (walking and cycling). There is no on-street parking on either the FHV or the LLM network. Pavement space for on-street parking would nearly double the width of an LLM road, an unacceptable aesthetic intrusion and waste of land. 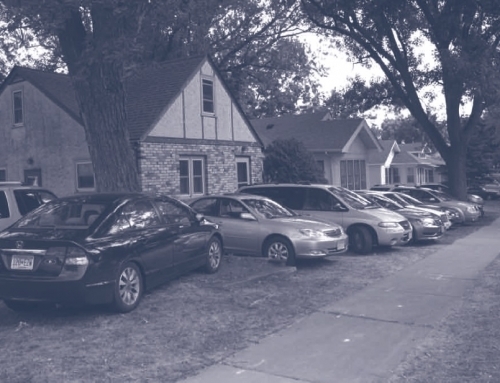 Instead, households and neighborhoods may build off-street parking as they deem necessary; likewise, the town and neighborhood centers will provide off-street parking. Town size is limited by the need to limit travel time on the LLM network to no more than what people are accustomed to in conventional town layouts. Given this, we estimate that the radial LLM streets (and adjoining bicycle and pedestrian paths) leading to the town center generally should not exceed 1.5 miles in length. 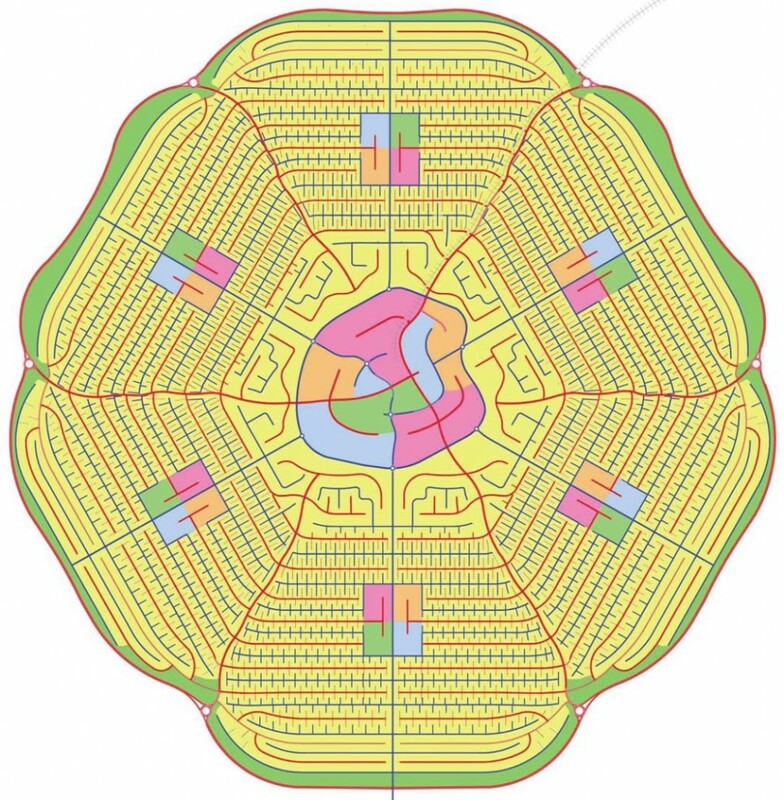 If the town center has a half-mile radius (enough to accommodate most of the civic and commercial functions of a medium-size town), the result is an idealized circular town of no more than about 4 miles in diameter, with a maximum area of about 12.5 square miles. At relatively high suburban, commercial, and residential densities, this accommodates as many as 100,000 people. Several of the ideas presented here have been implemented in actual towns or discussed in planning literature. We know of no proposed or actual plan, however, that explicitly connects kinetic energy to sustainability indicators or has the main features, scope, scale, and objectives of our plan. Suburban planning and urban design movements have a long history, from Ebenezer Howard’s 19th century Garden City to post-1980s neo-traditional design. Some have identified problems inherent in having a single road system for all types of vehicles. 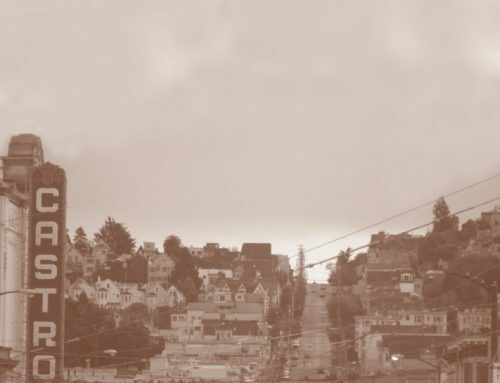 Over 35 years ago, William Garrison and colleagues at UC Berkeley examined how neighborhoods and roads should be changed to accommodate small, clean, and inexpensive motor vehicles. Although they addressed many of the issues we do, and came to many similar conclusions, they did not propose a comprehensive scheme for transportation and town planning. Many neighborhoods, and a few towns, have an extensive dedicated bicycle and pedestrian path system that is accessible to most or all homes and does not intersect with the conventional street system. Examples of these include the Village Homes neighborhood in Davis, California; the town of Radburn, New Jersey; and the town of Houten in the Netherlands. Houten, a town of about 50,000 residents near Utrecht, comes closest to what we envision. It has a dedicated bicycle network consisting of collector routes originating in residential neighborhoods and connecting to a backbone that runs to the city center. It also has a car-only network consisting of an outer ring road from which car roads penetrate into residential areas, provide limited access to the city center, and occasionally interlace with the dedicated bicycle pathways. 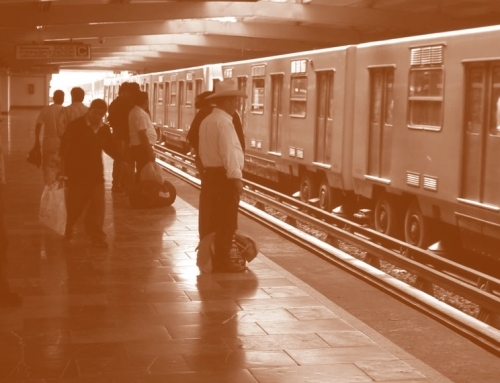 This plan can make transportation more sustainable in several ways. Most importantly, the proposed dual network can improve safety by separating LLM vehicles from FHVs. Travel on the LLM network involves lower kinetic energy and thus, all else equal, will have fewer impacts on air, water, and noise pollution, as well as climate change. Lightweight, low-speed vehicles and the infrastructure that supports them also require less material input, and this further decreases the environmental, economic, and social impacts associated with infrastructure development. An LLM network, and the promotion of LLM vehicles, has other social benefits. LLMs are low-speed, safe, convenient, and inexpensive, making them attractive to the young, the elderly, the poor, and those without licenses to drive FHVs. The LLM network’s hub-and-spoke layout also facilitates public transit within and between towns by affording everyone convenient access to transit stations in the town center. These benefits can be achieved with lower transportation costs than in towns with conventional road networks. We estimate our town to have lower vehicle ownership and operating costs compared to a conventional town, while the cost of the combined LLM and FHV infrastructure will be about the same as a conventional road network. There are several ways to implement our plan: build new cities in greenfields, expand cities at urban edges, infill undeveloped or brownfield spots in urban areas, or retrofit existing cities. The scheme is especially well-suited to rapidly developing countries already investing in new urban infrastructure, because it accommodates automobile growth but with lower societal costs. In greenfield developments, the proposed towns can be built whole. Alternatively, the transportation network and town can grow from one short radial arm and a rudimentary town center to a small city of 100,000 residents. A town can grow to a larger town in three ways: by adding LLM/FHV branches, by extending existing branches, or by increasing the density along existing branches and in the town center. 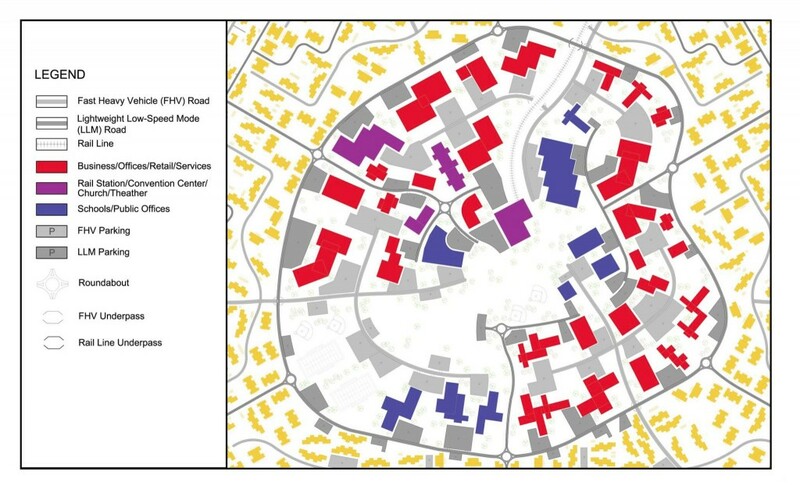 It might be easier to launch our plan in pieces by retrofitting parts of the scheme into existing cities. Retrofitting will be easier in cities with both a radial street system and room for new infrastructure. It will be difficult and costly, if not impossible, to retrofit cities already built up around a grid pattern of streets. Features of our plan, however, may be incorporated into existing street patterns by breaking grids in strategic locations. Developers, bankers, and mortgage brokers whose risk evaluations and profit motives must be satisfied if such plans and designs are ever to be built. In addition, researchers will need to model traffic flows on planned LLM and FHV networks to refine road-system design such as road width and the separation of motorized from non-motorized traffic on the LLM network. To accomplish this, more information is needed on how people may use different kinds of LLMs and how our plan affects vehicle ownership and household travel. Successfully implemented, the plan delineated here has the potential to foster transportation that is safe, convenient, economical, and environmentally sound and will allow for the development of more livable communities without restricting automobile use or suburban lifestyle. John A. Black, Antonio Paez, and Putu Alit Suthanay. 2002. “Sustainable Urban Transportation: Performance Indicators and Some Analytical Approaches,” Journal of Urban Planning and Development, 12(8): 184-209. Mark Delucchi and Kenneth Kurani. 2013. “How To Have Sustainable Transportation without Making People Drive Less or Give Up Suburban Living?” Journal of Planning and Urban Development, 140(4): 04014008. Nicole Foletta and Simon Field. 2011. Europe’s Vibrant New Low Car(bon) Communities, New York, New York: Institute for Transportation and Development Policy. Alyson Geller. 2003. “Smart Growth: A Prescription for Livable Cities,” American Journal of Public Health 93: 1410-1419.